PIOTR SALABER - born on July 30th 1966 in Wroclaw (Poland) composer, pianist and conductor. First piano classes with Selima Morska-Welminska, diploma from the Secondary Music School in Torun (the piano), with Barbara Muchenberg. Graduated from the Academy of Music in Bydgoszcz. There he got his Master Degrees - first in choral conducting under prof. H. Gostomski, and later from the Faculty of Composition, and Theory of Music. In 2005 he earned a doctorate in musical arts as a conductor (2005) and habilitation (2012), since 2013 is the professor of Academy of Music in Bydgoszcz. He also studied composition with - KARLHEINZ STOCKHAUSEN during master classes of Interpretation and Composition Courses in Kuerten (Germany) 1998-2002, and with Alain Savouret and Elzbieta Sikora (IV International Course for Composers, Gdansk 2000). Awarded with Amadeus - the composer's prize of The Polish Radio Theatre (2017) and The Honorary Pearl of Polish Market in the field of Culture (2017). Singing his own songs, he was noticed by critics and audiences at the Polish Song Festivals in Opole and Cracow (1985 - 1986). 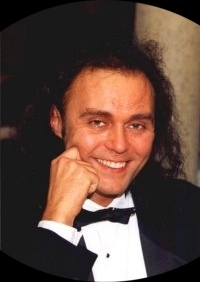 In 1999 "The Pirates" show with his music was noticed by the jury of The International Festival of Television Art in Montreux and was regarded as one of the best programs in its category. His records are also available in the National Library of Poland. So far he composed the music for over hundred of theater premieres, more than 100 songs and many popular Polish - TV and Radio programs (e.g. Piraci, Na kazdy temat, Kocham Polskę). The TV show - Piraci (The Pirates), three feature movies and TV series. Constantly works with Polish Radio and Television, also with theaters in Poland (Atheneum, Warsaw), and Russia (the Bolshoi Drama Theater, St. Petersburg), France (Atelier - Theatre, Paris), Canada (The Popular Theatre, Vancouver) and Hungary (Csokonai Theater, Debrecen, Nemzeti Színház – National Theater in Budapest), Puppet and It's Double Theatre, (Taiwan). On September 12th 1992, in the pages of The Boston Sunday Globe, Phyllis Krasilovsky wrote about one of his piano recitals on board the Renaissance VIII as it was sailing along the coast of Eastern Africa - "... Peter Salaber, a Polish crewmember, mesmerized passengers with an all - Chopin piano concert." Working for two years as a pianist, he also traveled to Indonesia, Egypt, Mauritius, Kenya, Madagascar, Tanzania, Singapore, Comoros and the Seychelles. On his journeys he wrote reports for Polish newspapers, e.g. an interview with one of the authors and producers of Dynasty - R. E. Pollock. During his travels he found inspiration for his music while diving and searching the deep waters and caves in Africa and Indonesia. From 1994 to 2001 he worked as the musical director of Teatr Polski (drama theater) in Bydgoszcz He works with the best Polish theatrical directors and plays concerts in Lithuania, Russia, the Czech Republic, Germany, Sweden, U.S.A. and Canada. He is a member of the Polish Association of Authors - ZAiKS. In 1997 he got the prestigious annual awards from - Provincial Administration of Bydgoszcz and from BIK - a culture magazine. Since 1997 he has conducted many concerts with the Pomeranian, Kielce, Wrocław, Kalisz, Zamość and Łomża Philharmonic orchestras in their concert halls and Óbudai Danubia Zenekar at the National Theater in Budapest. He also wrote the music for the movie about Bydgoszcz "Be my guest...". In 1997 he published his first CD - "Lokomotywa" with music for children. It got very favorable reviews in numerous newspapers and a recommendation from the Ministry of Education. On 19th of March in Konzertsaal of Solingen near Cologne (Germany) a concert of a symphony orchestra and a jazz trio took place. The Bergische Philharmoniker and: Markus Stockhausen - trumpet, Arild Andersen - double bass and Patrice Heral - drums, played a piece entitled Choral & Sehnsucht. This was the result of an invitation by Markus Stockhausen to Piotr Salaber to work together on this composition during his staying in Cologne in January, 2002. Since September 2000, he has been playing the piano with his own orchestra "SALABER BAND" on one of the most popular Polish TV shows - "Na Kazdy Temat Show" by TV POLSAT. On 19th of April 2002, the Chapter of the "Citizen of Bydgoszcz Plebiscite" awarded Piotr Salaber with the title of Laureate for the year of 2001. In June 2004, Tv program - JOKER, co-created by Piotr Salaber - was awarded with the Blue Hat Award as the "funniest Polish talk show" at the Festival of the Good Humor in Gdansk. Music by Piotr Salaber for "Karamazov Brothers′" was awarded with the prize - "The best music of the 2006/07" by the "Theater" Magazine. The Operetta by W. Gombrowicz with music by P. Salaber, dir. by A. Bubień performed by the National Theatre of Budapest and Óbudai Danubia Zenekar, won the Grand Prix at the XI International Gombrowicz Festival in Radom (2014). Since the academic year 2006/2007 he has been giving lectures on film music at the Institute of Audiovisual Arts at the Jagiellonian University in Kraków, and since 2010 at the Academy of Music in Bydgoszcz, in 2016 as a guest lecturer also in Vancouver (Canada) at the University of British Columbia.